1 New York City is one of the world's biggest cities. It is also one of the world's most expensive cities. To live in a prestigious neighborhood there, people are willing to pay a premium for it. Of all the housing choices available, apartments alongside Central Park are definitely the most sought-after. 2 Central Park was the first landscaped public park in the United States. Since its inception in the mid 1800s, its 843 acres of land have been a playground, a theater, a concert hall, a reservoir, a zoo, and a gym for all New Yorkers. The park's appeal is why its surrounding areas are so costly. Among all the residents who have the privilege of living by Central Park, one couple got evicted on December 7, 2004, for their displeasing behavior. Their offenses included never paying rent and littering sidewalks. The couple's misfortune jumped to the national headlines right away. Though they never once came forward to defend themselves, they had plenty of people standing behind them as their advocates. 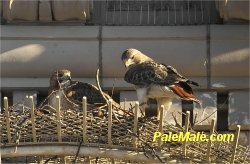 The duo's names were Pale Male and Lola. They were not humans. They were red-tailed hawks. 3 Red-tailed hawks are the most common hawk species in North America. They stand up to 23 inches tall and weigh from 2-4 pounds. Their feathers are brownish gray. They have reddish brown tails. Their chests are white. Their feet are yellow.